Today's engine development demands a balance between power and low fuel consumption and low emissions. A combination of good power output and low emissions can be obtained with a small cylinder volume engine for low fuel consumption with a turbo charger to up the power output when needed. 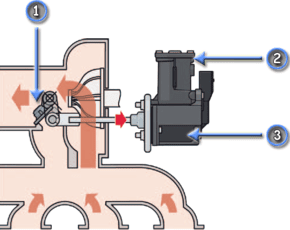 The engine in this measurement is equipped with a turbo charger which contains a waste gate valve in the exhaust gas stream to bypass the turbo, see figure 1. The waste gate opening can be changed according to the pressure needed in the intake manifold which in turn determines the power output of the engine. The waste gate position is controlled by the ECU with a DC motor. A position sensor gives feedback to the ECU about the position of the waste gate valve. The waste gate valve is held closed by a spring which is situated in the DC motor. The DC motor is mechanically connected to the waste gate through some reduction gears. 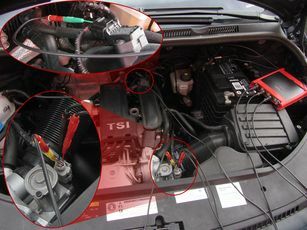 Both terminals of the DC motor are electrically connected to the ECU, which controls the DC motor, and therefore the waste gate, in both directions. The position sensor gives the ECU feedback about the position of the waste gate. The sensor is a Hall type with electronics to convert the sensor signal into a voltage from 0.5 V to 4.5 V. The charge pressure sensor is based on the MAP sensor and works in a similar way with increased range to detect the higher pressures. The lab scope is connected to the DC motor, position sensor and pressure sensor via a Measure lead TP-C1812B and Back Probe TP-BP85 and set to recorder mode. In recorder mode a streaming measurement is performed, continuously displaying the signals live on screen. Most measured signals vary slowly, except for the DC motor control signal. The Automotive scope ATS5004D is set to a streaming speed of 10 kS/s to correctly capture all signals. Figure 4 shows waveforms of the DC motor, position sensor and pressure sensor of a car which is accelerating trough 1st, 2nd and 3nd gear with a engine at operating temperature. This signal can be downloaded and used to correctly set up the lab scope or as reference signal. 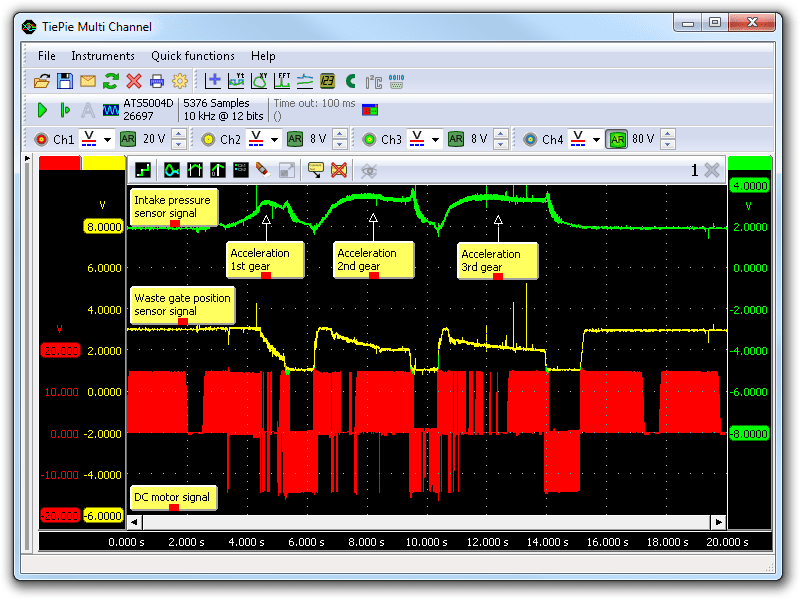 Channel 1 (red) shows the signal of the waste gate DC motor, channel 2 (yellow) the waste gate position sensor and channel 3 (green) the charge pressure sensor. The measurement is started when the engine is idling and the car is ready to accelerate. After shifting to 2nd gear, the charge pressure regulation system is keeping the waste gate valve in a closed position which can be seen in the high yellow signal. When the turbo has reached its working range the pressure starts to rise which can be seen in the rising green signal. Subsequently the position of the waste gate is adjusted by the ECU with the DC motor to control the charge pressure, the yellow signal drops indicating an opening waste gate valve. The charge pressure is kept at a certain level with adjusting the waste gate position throughout the acceleration until 3rd gear is needed. When the throttle is released to change gear, the created pressure needs to be released and the ECU fully opens the waste gate which can be seen in the yellow signal that drops to 1.2 V. The green signal shows a slight rise in charge pressure as the turbo still has some momentum but the turbo quickly slows down and the charge pressure drops. When 3rd gear is selected and acceleration can be continued, the waste gate is closed again to increase the charge pressure. Signal values may differ on different types of engine control units and turbo charge pressure regulation systems. Consult ATIS for information on specific engine control units and turbo charge pressure regulating systems. For charge pressure sensor signal deviations read the article about MAP sensor diagnostics. With a lab scope a Manifold Absolute Pressure (MAP) sensor is measured under the following conditions: key on, cranking, idle, 2000 RPM, 3000 RPM and back to idle with an engine at operating temperature. The signal from the sensor is shown and can be downloaded. To help determining whether a MAP sensor is functioning correctly, different possible deviations from the example signal are mentioned along with probable causes. This document is subject to changes without notification. All rights reserved. The information in this application note is carefully checked and is considered to be reliable, however TiePie engineering assumes no responsibility for any inaccuracies. Before measuring, check that sources of dangerously high voltages are switched off or shielded from contact. Voltages considered to be dangerous are voltages over 30 V AC RMS, 42 V AC peak or 60 V DC. Keep a clean working environment when doing measurements. This measurement and procedures are a examples / measuring suggestions and are no prescribed protocols. TiePie engineering can not anticipate the safety actions that need to be taken to protect persons and appliances. Before starting a measurement, check which safety measures need to be applied.